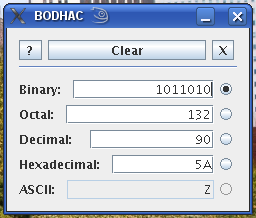 BODHAC is a Binary-Octal-Decimal-Hexadecimal-ASCII Converter application I wrote using Java. It is a very simple application for quickly converting numbers between the bases commonly used in computing (radix 2, 8, 10, 16) and standard 8-bit ASCII characters. It is currently BETA software, and should be used at your own risk. BODHAC was created and tested using Java 1.5.x utilities, and should work with Java versions above 1.5.0. BODHAC is distributed under the terms and conditions of the GNU General Public License (GPL) version 3, which can be viewed in full at the following link: http://www.gnu.org/licenses/gpl-3.0.html. The executable JAR file and needed libraries can be downloaded from either the Zip or Gzipped-Tarball files below.